Baroness X has been feeding us deliciousness via Polish Pickup while she has been abroad this winter. When I read that the theme for April's PPU was going to be Space, I admit to doing an internal happy dance. I admit to being a little bit excited for April's PPU theme. I am a bit of a space nerd...which is no surprise to long-time readers of this blog. I did a whole series on the Planets, so you know I was ready for this month. When Demi said she was going to do an Acetone Antidote, I was aflutter about what scent it could be! What does space smell like? According to actual astronauts it smells like hot metal and burnt meat. So...maybe I'm glad Demi went in a different direction? This Antidote was inspired by the recent SpaceX launch, and the ruby-red Tesla and her pilot...currently orbiting our little blue marble. The scent is a cozy blend of vanilla, with hints of black cherry and leather. It has a lovely, snuggly vibe to it...and I hope this concoction finds its way into the BX Wax lexicon. It is a good "chilly night" scent. If you've never used one of these Acetone Antidotes, you are really missing out. Straight acetone is the best thing for removing nail polish, but it dries out your skin and leaves a horrible white caste across the skin. 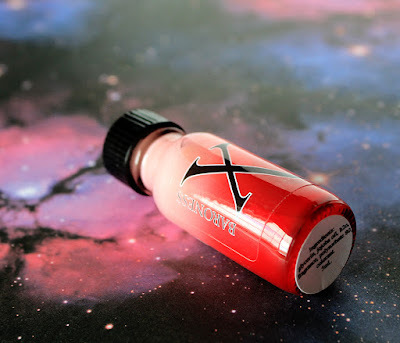 By mixing this vial into about 6oz of acetone you have a nourishing, moisturising, and fragrant polish remover without sacrificing any strength. I cannot live without these. I keep a mixed bottle (currently a Lord of Misrule blend), plus I add a drop of whatever new scent I'm in the mood for to my clean-up dish. The best part is that once the acetone fully evaporates...your trash can will smell delightful. It is the little things in life, guys. 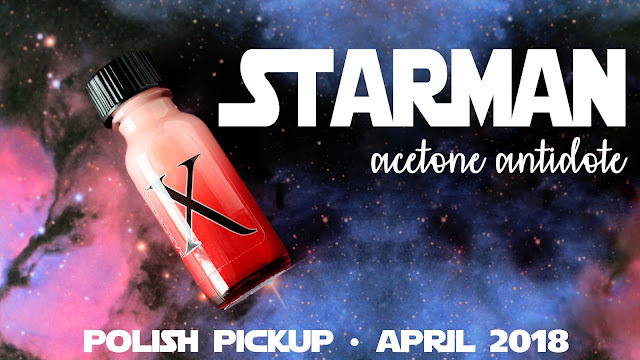 The Starman Acetone Antidote will be available at the Polish Pickup on April 06, 2018 at 11am eastern. There is a cap of 190 and they are only $4.75. In the past, these have sold out pretty quick...so I would definitely add these to your cart during your first order. The leather component sounds interesting! That sounds like a nice smell. I have yet to purchase one of these.